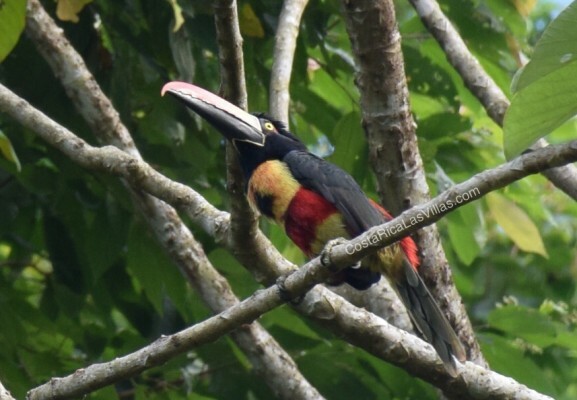 Huge windows, covered deck, outdoor Jacuzzi – plus howler monkeys, toucans, scarlet macaws and cusingas (birds) – this is a perfect place for relaxation and privacy. Sitting next to the jungle this villa rental sports an outdoor hot tub spa which is the perfect place to listen to the creek that runs close by while you soak it all in. Casa Cusinga is a great location to view amazing wildlife, including cusingas (see photo), howler monkeys and blue morpho butterflies. This beautiful jungle house gives one the ability to enjoy the privacy that Costa Rica’s jungles have to offer, while at the same time, the easy access ensures that clients are still close to the beaches, hiking and wildlife. Howler monkeys, toucans and lapas have been seen from this house. The home rests 75 feet above a creek offering year round relaxing sounds. The 200 year-old pavel trees that can be seen and hiked to from the home are amazing (takes 4-6 people holding hands to reach completely around the base of the trees). 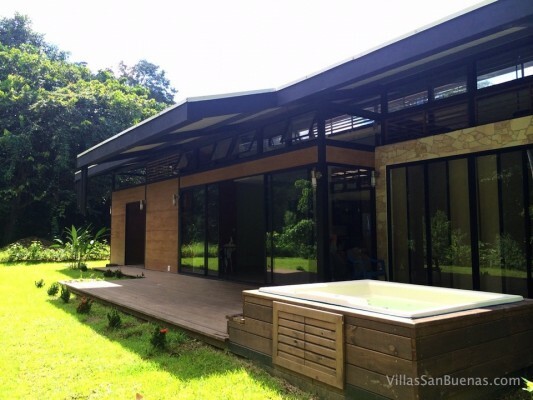 This Costa Rica Jungle House rental has a modern design, with 16 feet (5 meters) high ceilings, and indirect LED lighting throughout. The lighting embedded in the deck offer a lit path to the LED embedded outdoor Jacuzzi. Master bedroom has sliding glass walkout to private Jacuzzi. Enjoy a video highlighting Casa Cusinga and the surrounding area.